Over the last 30 years, the German federal Ministry of Education and Research has funded a diversity of scientific projects dealing with biotechnology and the safety of its application. Until now, over 300 projects were funded with an overall budget of more than €100 Million. Since 1998, a focus of this research programme is the biosafety of genetically engineered crop plants. In large collaborative projects, unifying public research institutes, universities and academia, as well as smaller companies, many aspects of the potential ecological impacts of the cultivation of GE crops have been studied – and are still under investigation by a consortium of scientists with a long track-record in ecological biosafety research, who are currently assessing the biosafety of a stacked maize variety with Bt-resistance genes against two different maize pests. The core of the consortium is a field-release experiment located at a public research institution in Braunschweig. All partners carry out substantial parts of their respective projects at this site. 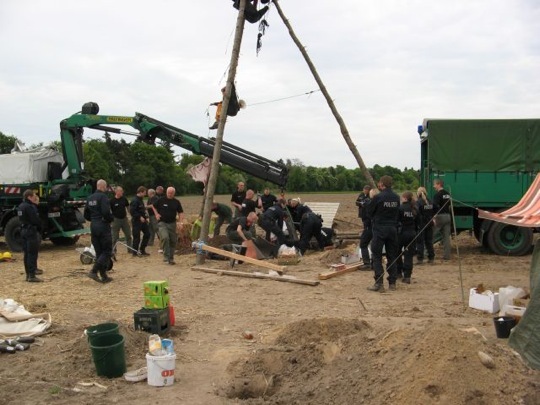 In April 2009 the field trial site was seized and blocked by a group of radical anti-biotechnology activists. The group’s expressed aim was to stay as long as it took to prevent the maize from being planted. The activists were violating law (trespassing, breach of domestic peace) and had to be removed by the police; they established a camp in front of the research institute however, and threatened to destroy the maize as soon as it had been planted. To ensure the safety of the field experiment and thus safeguard the completion of the experiments, special security measures had to be taken. The field site was patroled by a private security firm 24/7 for a duration of 4 months. These measures caused additional costs of over €100,000. They were covered via a replenishment from the Ministry. The research consortium is funded over 3 years with a total budget of around €2.1 Million. The additional costs for security accrued to around 4.5% of the total funding.